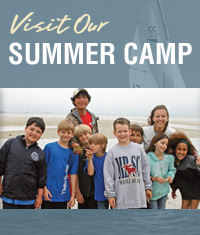 Bring your group staying at Cape Cod Sea Camps to the Wellfleet Bay’s Wildlife Sanctuary to see live birds at their Bird Banding Research Station. 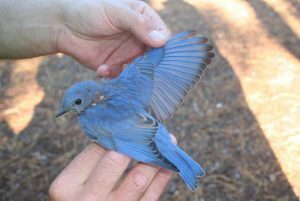 What is Bird Banding? Once a bird is captured in one of our 24 mist nets, a series of data is collected from the bird, and it is given a small aluminum “anklet” with a unique number, much like a fingerprint. It is the only bird in the world now wearing that ID number! Banding can reveal how, and where, migrant songbirds are using habitats to stop and refuel. This helps us better manage surrounding habitats to protect their populations, and learn more about their species. Group banding demonstrations provide the rare chance for people to see birds at close range. For children, it’s an experience that can spark a lifelong passion for wildlife and the environment. Bird banding began here in 1929, and returned to Wellfleet Bay in 2014. They band during spring and fall migration when birds are heading to or leaving their breeding grounds. Bird Research programs are $130/hr, maximum of 20 people. The Wellfleet Bay Wildlife Sanctuary is happy to develop multi-activity programs surrounding bird research for larger groups, or those interested in a longer visit!